Cleveland native Johnny Gargano celebrated his NXT Championship victory by going to Disney World with his wife, Candice LeRae, and the title belt on his shoulder. Cleveland native Johnny Gargano celebrated his NXT Championship victory by going to Disney World. CLEVELAND — It has become commonplace for key members of the Super Bowl-winning team to find a camera and say, “I’m going to Disney World,” but trips to “The Most Magical Place on Earth” are not limited to champions in the National Football League. 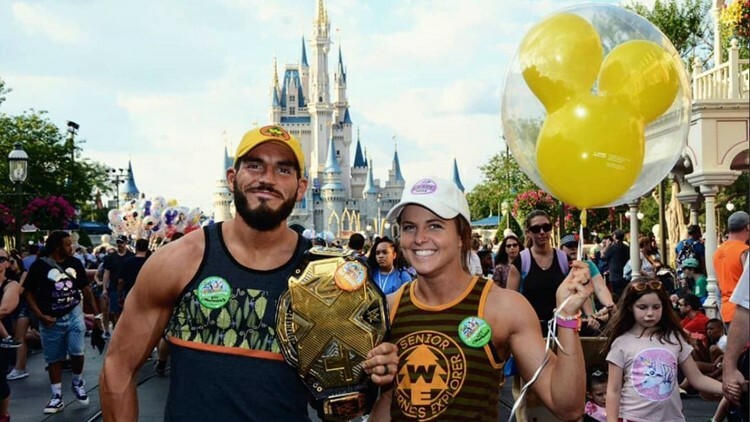 One week removed from his NXT Championship victory, Cleveland native Johnny Gargano took his wife, Candice LeRae, a fellow superstar, and the title belt to Disney World to celebrate. When Gargano reported to the WWE’s Performance Center in Orlando four years ago, he was not a heralded prospect and did not have a contract, but through hard work and determination, has risen to the top of the mountain in NXT, World Wrestling Entertainment, Inc.’s developmental territory. Despite getting pinned to lose the first fall, dealing with interference behind the referee’s back by Roderick Strong, Kyle O’Reilly and Bobby Fish of Undisputed Era, and withstanding multiple “super kicks” and “last shot” knees, Gargano rallied to defeat Adam Cole in a two-out-of-three-falls match and win the NXT Championship for the first time in his career in the main event of NXT TakeOver: New York at Barclays Center in Brooklyn on April 5. Gargano clinched the championship victory when he ducked a “last shot” knee attempt from Cole and put on the “Gargano Escape” submission hold. After rolling back to the middle of the ring to prevent the rope break, Gargano locked in the submission once again and forced Cole to tap out for the deciding fall in the match. In front of an NXT-record crowd of more than 15,000 passionate fans, including Gargano’s parents, Frank and Adrienne, the fiercely proud Clevelander broke a losing streak of sorts, as he had not won a TakeOver match at the Barclays Center before beating Cole. After celebrating with LeRae in the ring and both fans and family members at ringside, Gargano walked up the entrance ramp to roaring applause from the raucous crowd. However, before Gargano could head back to the locker room, his longtime tag-team partner and recent archrival, Tommaso Ciampa, hugged both him and LeRae, much to the delight of those in attendance. With the victory over Cole, Gargano became the first-ever NXT Triple Crown Champion. Gargano won the tag-team titles under the WWE banner with Ciampa as the popular team known as “D.I.Y.,” and earlier this year, claimed the NXT North American Championship at NXT TakeOver: Phoenix. “Literally, I’ve dreamed about this day for a very long, long time, and I tried picture it,” Gargano said. “I tried to imagine what it would be like, and this isn’t even close. I couldn’t dream up a more perfect scenario than right here. It’s so cool and it’s so awesome.